I'm so impressed by this reproduction! Incredible! Wow, this photo is wonderful! Where did the inspiration come from? Thank you! I am looking forward to stretching myself further with this challenge each week! What a way to begin this challenge. Have I mentioned lately just how thrilled I am to be following your project?! Way to go, Heather. Absolutely fantastic. This is amazing, Heather. Just like you! You have captured the light and painterly qualities perfectly. I am blown away. Loved visiting tonight. You always make my heart smile. <3 Thank you all so much! I am so very happy that you all enjoy this as much as I enjoyed making it! Madonna, ditto to you my sweet friend! 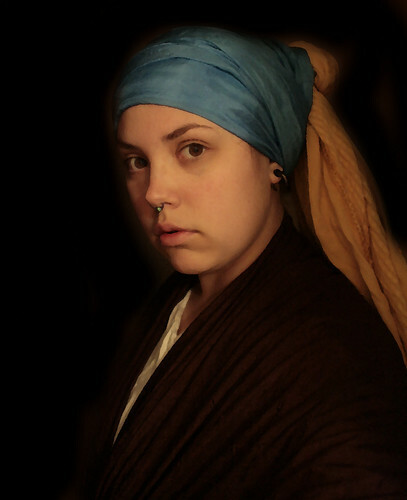 Jess, the blue piece of my head wrap is a silk belly dance veil I had dyed last year (and just happened to be the perfect color) and the brown part is a skirt haha. Hello; I'm a good friend of Misha's and she sent me over. I am blown away by the level of creativity and commitment to self. Bravo and all the best. You are an inspiration! Hello Rick! Thank you so much for your kind works and welcome to my project.